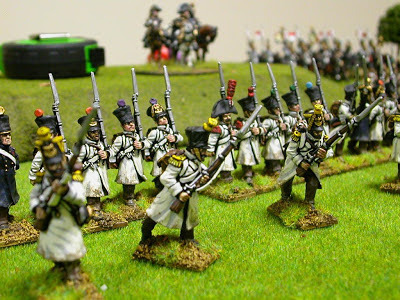 I've copied a few of the pics from my mate Davids blogsite (http://wardepot.blogsite.com/) and he takes better pics than me. 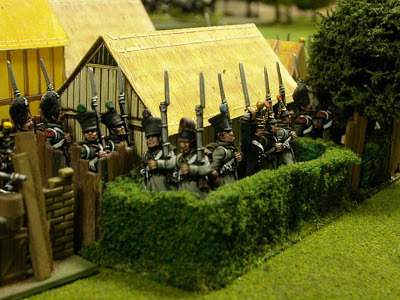 French ligne battalion in defending a village. Please note the cardboard buildings. Most of my buildings are from the Osbourne model building series. I was once, many many years ago, a professional Architectural model maker! 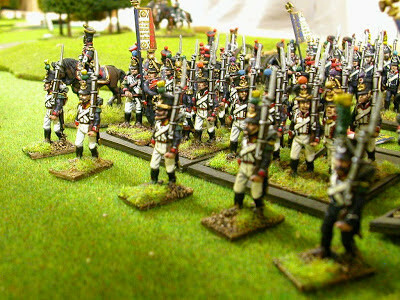 The 13th Dragoon regiment, one of 10 regiments in my collection. All are WF. 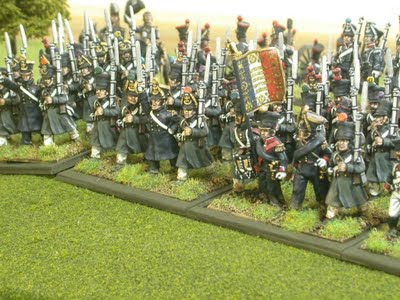 More French infantry on the move. 122nd Infantry Regiment in white greatcoats, very common in the Peninsular War. 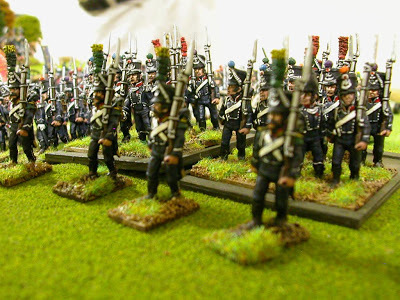 WF & Perry miniatures. 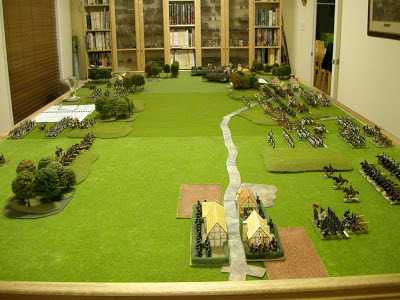 A shot of the 6' x 12' table in the wargames room. Big thanks to my wife Cathy who allowed me to convert the formal dining room into the "Games Room". 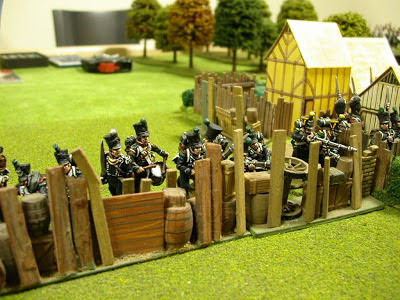 French Legere behind the barricades, all Perry Minatures. Terrific figures. 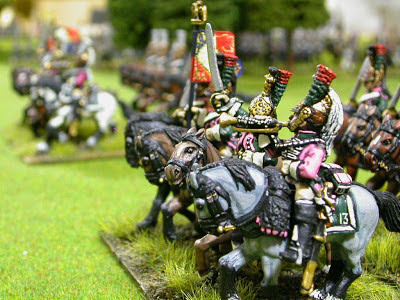 37th Ligne advancing towards their Austrian foes. All my units are on movement trays. I've allowed room at the back of the trays for a tab stating their title and morale grade. Makes life so much easier getting the troops around the table. Fantastic pictures, wonderful work on the figures and on the photos! 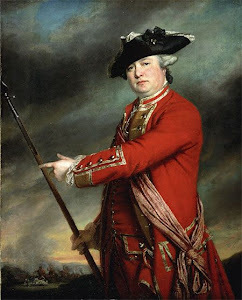 I really like you 13th Dragoon regiment and 122nd Infantry Regiment in white greatcoats, fabulous! Like most wargamers in their 50's I started off with Airfix 72nd & 32nd scale figures (+Timpo) using Bruce Quarry, Donald Featherstone & Charles Grants rules. I grew up in Queensland where you couldn't buy metal figures and I had to order from Melbourne and then eventually directly from the UK. Minifigs were my first metals and I then progressed to Wargames Foundry (& eventually to Perry). Napoleonics is my passion, though I am just as keen about the Imperial Roman era and have dabbled into SYW. I have a great friend Geoff who has been an inspiration for me to always improve my skills and motivate my sometimes flagging interests. He is an excellent modeller and painter. I'm very lucky to have an amazing and supporting wife who understands the time required to invest in the hobby. My current projects are the 1814 Camapign for France and revisiting my Romans after our latest trip to UK / Hadrains Wall country. Iam also an Assistant District Commissioner in Scouts Australia.